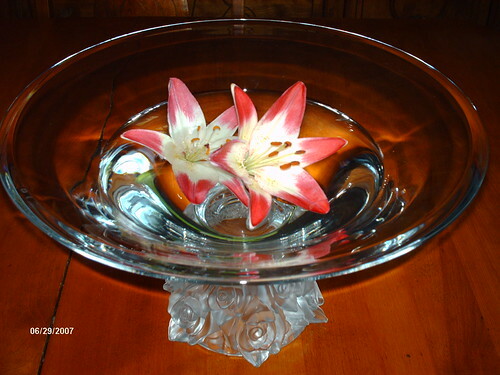 Imagine our surprise to be presented with this beautiful crystal bowl as an anniversary gift from Anna and John. We were both so touched by their generosity and thoughtfullness. This, as they welcomed us with opened arms for a week. What an exquisit way to display the perfection of one or 2 beautiful flowers. What is in there now are from my front yard...it's a perennial called Lilium (lollypop colour). I have since changed the flowers to a bright yellow Lilium. As long as I have blooms, they will be displayed on my kitchen table in this bowl. 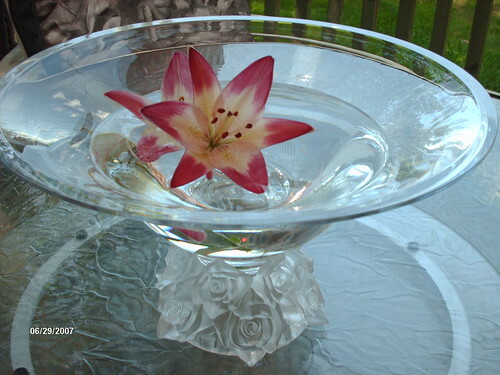 Thanks so much Anna and John..I have gotten comments from everyone who has entered and seen this bowl with the flowers. For some sillyness, I had to throw in some picks of the babies. 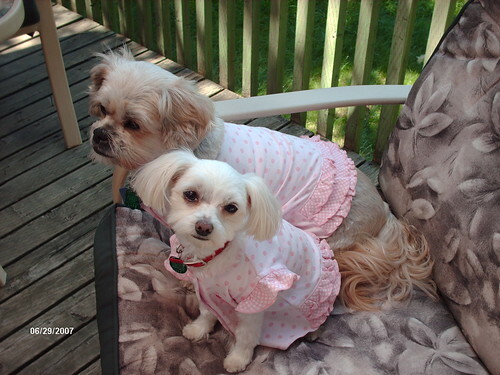 I got these matching clothes for the dogs in Chicago lol. Yes they get something from our trips too. I saw a dog section of clothes in a department store, which always perks me up..and makes Chris roll his eyes. There was nothing I liked..to my disappointment and Chris' relief. BUT then ..as we are walking by the baby clothes section, the lightbulb over my head lit up. 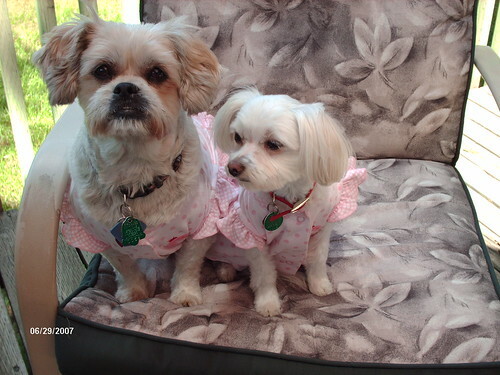 To my joy and Chris' shagrin...I figured some baby clothes would easily adapt to the dogs..so humming and awing to all the adorable clothes...and trying to figure out what could work..while Chris to his credit...was patient while endulging my silly whim. I got these cute little tops, that were actually a baby one piece..I cut off the bottoms and sewed the edges all around, to make them a top or dress. I have figured out that Shinoo is a 9 months and Clochette is a Newborn size lmao! I realize that Shinoo looks rediculous in this. Clochette pulls it off cause she is little and more girly looking lol. I had to take a few pics to show my friend but I won't be putting this on Shinoo again lol. They both actually love having clothes, they both come running when I pull out some of their few pieces of clothing. Tails wagging they can't wait till I put it on. Unlike bath time, they both try to hide lol. So just to assure u all, I am not torturing my babies out of a silly indulgance on my part. I do however realize that this frilly stuff does NOTHING for Shinoo lmao! Poor thing...I swear it's being put away. Posted by Moon at 5:00 p.m. The bowl and the lilies are beautiful, Moon, and your babies are darling! I'm so glad you like the bowl, when I saw it I knew it was perfect for your table. Clochette looks absolutely adorable and all Shinoo needs is a Cubs jersey! Thanks for making my week so special, next time you guys need to stay longer.